The Real Estate School, Inc. has been training Florida real estate professionals for more than 30 years. We offer online courses as well as traditional classroom courses. Our online courses include pre-licensing post-licensing and continuing education, with a wide variety of supplemental material to help candidates pass the Florida real estate exam. Our instructors are personable and knowledgeable, with years of experience in the fields of real estate sales, brokerage and appraisal. With live classes taught by outstanding instructors, we've got you covered with a complete selection of Florida real estate courses. Take your 14-hour continuing education course online or by correspondence. This course includes 8 hours of specialty education, 3-hours of Core Law, and 3 hours of Ethics and Business Practices. Tuition starts at less than $22. Enroll now! Take your 28-hour reactivation education course online. This course is for persons whose license is involuntary inactive. Save your license by enrolling now! Take your 63-hour prelicensing course online. Fulfills the Florida Real Estate Commission's (FREC) education requirement for all persons wanting to become licensed sales associates (real estate agents) in Florida. Available online. Enroll now! Take your 45-hour post-licensing course online. Fulfills the Florida Real Estate Commission's (FREC) education requirement for a sales associate's first renewal. Available online. Enroll now! Tuition starts at just $175. Take your 72-hour pre-licensing course online. Fulfills the Florida Real Estate Commission's (FREC) education requirement for becoming a Florida Broker. Enroll now! Tuition starts at just $325. Take your 60-hour post-licensing requirement online. Our two 30-hour courses fulfill the Florida Real Estate Commission's (FREC) education requirement for Florida Broker post-licensing education. Enroll now ! Tuition starts at just $165 per course. 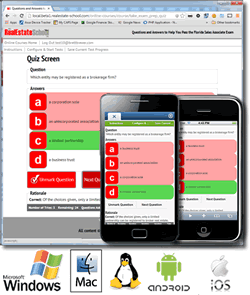 We've got all the exam prep software, books, audio cds, cd-roms and textbooks you need to PASS your real estate exams the first time. Florida Broker Exam Prep CD-ROM. Florida Sales Associate Exam Prep CD-ROM. Florida Mutual Recognition Exam Prep CD-ROM. Florida Real Estate Exam Review Manual. Florida Real Estate Exam Prep Audio CDs and Books. Can't find a Florida Real Estate Commission form or need to know the location of your nearest testing center? Take the free 100-question practice exam. Florida Real Estate Commission Forms. FL Sales Associate and Broker Exam Candidate Handbook. Florida Real Estate Commission Statutes and Rules. Apply online to take or retake your Florida Real Estate Licensing Exam. Thinking of getting into the Real Estate business, but don't know where to start? Here's a guide to the steps you should take. Qualifications and requirements for obtaining a Florida real estate license. Step By Step - how to get your Florida real estate license. Real Estate Career Information and Statistics. Everything you need to know about licensing: FAQs from the Florida Real Estate Commission. Log in to your online course. A great companion to any FREC approved pre-licensing course. We developed our online exam prep software specifically to help you pass the state of Florida's sales associate, broker, and mutual recognition licensing exams. You can create tests from specific categories of questions or random selections from all categories. Missed questions can be manually or automatically marked for later review. All marked questions from various quizzes end up in a single review group and remain in your review group until you remove them. Works with virtually any internet-connected device. All you need is an internet connection and a browser. Save your tests at any time and pick up where you left off on any internet-connected device! A career in real estate starts with The Real Estate School. We offer real estate pre-license, post-license and continuing education courses in the classroom and also provide online courses for real estate professionals. Please take a few minutes to explore our site. You will find information on our school, our course offerings and our instructors, as well as important resources for real estate professionals such as links to real estate laws and other industry-related sites. Conveniently located in Tallahassee, at 2110 Centerville Road, we have been training real estate professionals in North Florida for more than 30 years. We have helped more students obtain real estate licenses than any other school in the area. You'll love the wall-to-wall windows with tree-top views. Our instructors are personable and knowledgeable, with years of experience in the fields of real estate sales, brokerage and appraisal. We realize that choosing the best real estate school can be a tough decision. We encourage you to see what our students have to say about us. If you're in the Tallahassee region and considering taking one of our classroom courses, feel free to call a few local brokers and ask them which real estate school they would recommend. We're confident they will send you to us. If you have any questions that have not been answered by your visit to our site, please contact us and let us know.